Hot and humid days makes running much more challenging. It’s impossible for the body to perform as well as usual in sweltering temperatures and humidity levels, and can make even a short run feel like a marathon. Research has heavily suggested that running in the heat is an extremely worthwhile workout, so you shouldn’t stop training just because it feels too hot. Training in the warm weather encourages your body to sweat more (which keeps you cool), increase your blood-plasma volume (which benefits cardiovascular fitness), and lower your core body temperature – all of which are incredibly beneficial and help you to perform better in any weather. However, it’s important to bear in mind that exercising in the heat can put you at risk of dehydration, heat stroke and other heat-related illnesses. Common sense is key to avoiding these problems, but below we’ve answered some frequently asked questions and explained our top tips for running in the hot conditions. Try to run during the coolest parts of the day, which is usually just before sunrise. The middle of the day, particularly between 10am and 4pm is when the sun’s intensity is at its greatest and is therefore the hottest temperature. If morning runs aren’t possible, try to stick to shady roads or paths. Remember that your body cannot perform to its usual levels in the blistering heat, so rather than attempting to run a distance, run for a set period of time. For example, if you usually run 12 miles in 2 hours, instead just run for 2 hours but at the same effort level as you’d normally train at. You probably won’t run as far, but you need to adapt your workout to the environment you’re training in. If you’re taking part in a virtual challenge, don’t panic about not covering as many miles as you usually do – remember you have the entire month to complete the challenge. If it’s particularly humid on a race day, scale back your performance goals – hot conditions aren’t the time to push your pace and try to achieve a PR. Another idea is to focus on place instead of time. If you know that you’re in the top 20 in a given race, don’t stress too much about your time, just concentrate on finishing in the to 20. The most effective way of preventing heat disorders is to keep your body hydrated. Sweat is composed of plasma from your blood, and sweating can decrease your blood volume, which is why adequate hydration is critical in hot weather. You lose electrolytes in your sweat, so consuming water and a sports drink or taking an electrolyte supplement is essential. You should be drinking water before, during and after exercise. Wear loose fitting, light-coloured synthetic fabrics (not cotton) that absorbs sweat and dries quickly – it’ll help your body to breathe and cool itself naturally through evaporation. Wearing darker clothes will absorb the sun’s light and heat, and tighter clothes will restrict the cooling process as well as become uncomfortable. 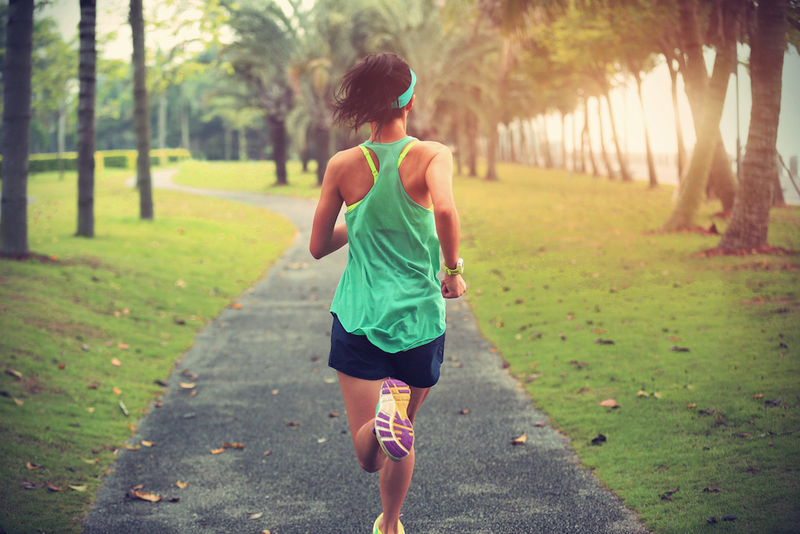 During the warmer temperatures, you should plan your route to make sure most of your run is in a shady area. Swap heat-radiating roads for grass, and make sure you have plenty of water available on your route. We advise running loops around a shady field or large areas not too distant from your house. This way, if the heat becomes too much for you, you can stop at any time and head home. It’s vital that you apply sunscreen whenever you are spending time in the sun, and running is no exception. Protect your skin with waterproof sunscreen that offers broad spectrum protection, protecting you from both UVA and UVB rays. If you’re running for longer periods of time, be prepared to re-apply when necessary. Not only is sunburn detrimental to your skin, but it will also restrict your body’s rate of cooling as injured skin loses its ability to sweat. If you’re really struggling to run in the hot weather, don’t be afraid to change plans and try something else out. For instance, attend a spin class or go swimming. As long as you keep up some form of exercise, you’ll maintain a level of fitness and be able to ease back into your normal regime when the days start to become more bearable. Don’t overdo it and avoid pushing yourself too much. If any signs of heat problems occur, such as starting to feel faint, dizzy or disorientated, stop running, sit in the shade and get some water on board. If at any time you’re particularly concerned, make sure you consult a specialist health professional. Here at Race at your Pace, we’re passionate about getting people outdoors and into fitness. We organise a variety of virtual challenges every month, and they’re a great way for people of all ages and abilities to keep active. It doesn’t matter if you are an elite athlete, or are just getting into fitness, we have a challenge for you!